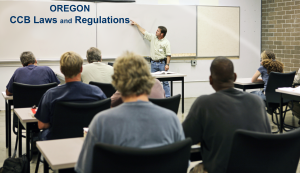 Most Oregon Residential Construction Contractors need eight hours of continuing education every two years based on your licensure date. Of these, three hours must be the State Laws, Regulations and Business Practices course, which are only available through the Construction Contractors Board. If you wish to take it in a classroom, these are the last four classes being held in 2016. The cost of the three-hour live (in-person) class is $45 and you can register through the Oregon Construction Contractors Board WEBPAGE. The online format of this course is also available on the site. The remaining 5 hours of continuing education must be in Series A business management, work safety or building code courses. These can be taken in a classroom or online as long as they are approved by the CCB for Series A Continuing Education. Licensed Less Than Six Years? If you have been licensed by the CCB as an Oregon Residential Construction Contractor for less than six years and your responsible managing individual (RMI) has less than six years’ experience, you need the same eight hours of Oregon continuing education described above PLUS an additional eight hours (16 hours total). These additional eight can be either Series A, Series B or a combination of both and can be taken in a classroom or online as well.